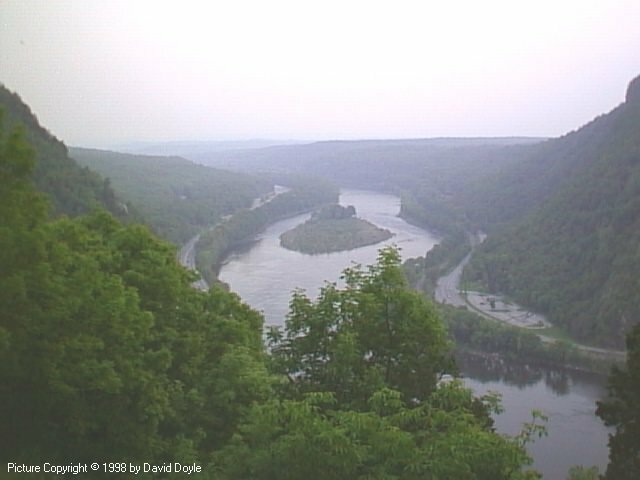 Above is a view of the Delaware Water Gap on the Pennsylvania/New Jersey border taken from Mount Tammany (1549 feet). On the left is Indian Head (aka The Gap), on the right you can just about see the slope of Mount Minsi (1461 feet). In the middle of the river is Arrow Island. Pictures from various hikes. (Updated 14-June-98 with new pictures). Your comments on this section are appreciated as I'm experimenting with the format! Just a few minutes drive out of the city of Scranton, PA in any direction will bring you to a host of woodland trails waiting for your exploration. Please stay on paths where possible as it is less damaging to the environment, and get permission from property owners before venturing on posted lands. This little website is meant to whet your appetite and encourage you to just go take a hike. Most hikes contain a sketched map. There is a map key available. Looking for a guided hike or walk? Then check out the list of hikes run by the Dunmore YMCA and the North East Chapter of the Sierra Club. Another excellent site is the PA Dept. of Conservation and Natural Resources. Please note that the majority of the hikes on this site were not researched by myself but by others - all I've done is convert them to web format. Know of any good hikes in the NEPA area which are not listed below? Then email David with your suggestions for hikes to be added!